If you require help with your college needs please ring 01270 630280 in office hours or email info@directsalonsupplies.co.uk with your contact details and we will get back to you. Rem Verona Vanity Unit, available in any colour from the Rem laminate colours, consisting of vanity section with basin and taps, internal beauty trolley, 3 large cupboards and large open shelving, open storage units and LED mirror. Dimensions width 205cm, depth 50cm, height 194cm. 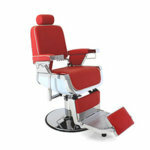 Direct Salon Supplies Cadillac Barbers Chair, hydraulic barbers chair wide large disc base, large comfortable seat with color matched stitching, manually reclining back rest with height adjustable head rest, large footrest with rotating leg support when the chair is in the reclining position. Dimensions width 67cm, depth 48cm and seat height minimum is 60cm, maximum 79.5cm, back rest height 40cm. 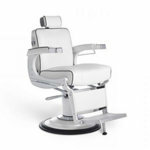 REM Emperor Hydraulic Reclining Barbers Chair in any colour upholstery from the Rem Fabric Chart with integral footrest, headrest and Chrome hydraulic base. 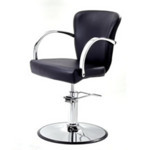 Fantastic looking salon chair with a classic design and feel. The Palermo features Chrome, rounded arm rests. The chair is upholstered in a hard wearing, easy to clean black fabric. With a wide seat and slightly curved backrest for ultimate client support and comfort. Ideal for any hair salon or barbers shop. Supplied on a heavy duty, rust proof chrome base. Available with a 5 star or round base option. Complete with a fitted chair back cover to help against spillages and stains. Comes with 5 year warranty on hydraulic base. A footrest is also available as an optional extra, please use the drop down box to choose. Dimensions: Seat Height 50 – 64cm, Width 63cm, Depth 64cm. 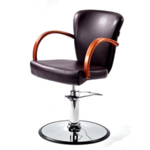 Fantastic looking salon chair with a classic design and feel. The Palermo features lightwood, rounded arm rests. The chair is upholstered in a hard wearing, easy to clean black fabric. With a wide seat and slightly curved backrest for ultimate client support and comfort. Ideal for any hair salon or barbers shop. Supplied on a heavy duty, rust proof chrome base. Available with a 5 star or round base option. Complete with a fitted chair back cover to help against spillages and stains. Comes with 5 year warranty on hydraulic base. Fantastic looking salon chair with a classic design and feel. The Palermo features Rosewood, rounded arm rests. The chair is upholstered in a hard wearing, easy to clean black fabric. With a wide seat and slightly curved backrest for ultimate client support and comfort. Ideal for any hair salon or barbers shop. 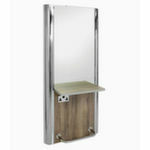 Supplied on a heavy duty, rust proof chrome base. Available with a 5 star or round base option. Complete with a fitted chair back cover to help against spillages and stains. Comes with 5 year warranty on hydraulic base. REM Evolution Black Hydraulic Chair is both stylish and robust. On 5 Star Base as Standrad, also available on Disc or Square Base as optional extra (Please Use The Drop Down Box To Select). Sizes: Seat Height 50 - 62cm, Width 60cm, Depth 69cm. Sizes: Seat Height 43 - 55cm, Width 57cm, Depth 63cm. 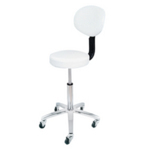 Deo Beauty Technicians Stool in white. A gas lift white stool with vinyl seat and 5 star base with chrome finish. Minimum Height measured from floor to top of seat 46cm approx, maximum Height 62cm approx. 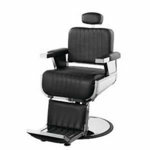 Takara Belmont Apollo 2 Elite Barbers Chair, the original classic Belmont Barbers Chair is comfortable, strong and reliable, with its cast metal body and wooden framed sprung seat with durable hydraulic base, reclining backrest and adjustable headrest. Includes strap hook and gown rail. Available on a choice of gloss white, gloss black and matt black hydraulic base, with black upholstery with white piping or white upholstery with black piping(Please use the drop down box to choose your base and upholstery). Dimensions Height 1055mm, Width 640mm, Depth 970mm, Depth when reclined 1330mm, Initial Seat Height 555mm. 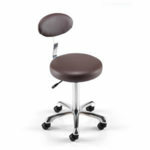 Deo Beauty Technicians Stool with back rest. 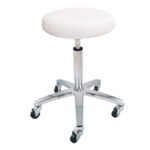 A gas lift white stool with vinyl seat and back and 5 star base with chrome finish. Minimum Height measured from floor to top of seat 46cm approx. Maximum Height 62cm approx. WBX Ascot Saddle Gas Lift Stool in jazzy pink upholstery, ideal for the beauty therapist. 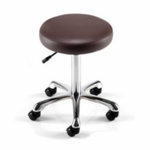 This saddle stool is in stock for immediate delivery. It is the ultimate hairdressing and beauty stool with a locking and infinitely adjustable seat mechanism, which means it will lock in any desired position when the seat is moved forward or back, which is shown on the red/black ascot stool image. What the ascot does is place your stylists or beauty therapist's back in the correct posture while cutting or styling hair or during beauty therapy. Case studies have proved that saddle style seating reduces back, neck and arm discomfort, improves leg circulation. The pink ascot comes with smooth running castors. You can pick from three height options standard 21" to 27 ½", high 25" to 33" or extra high 28" to 39". (Please use drop down box to pick your height option). Now available with Foot Ring. WBX Ascot Saddle Gas Lift Stool is the ultimate hairdressing or beauty therapist's stool. The Ascot stool with the infinitely adjustable seat mechanism (Locks in any desired position, as shown in image). This will place your stylists or beauty therapists back in the correct posture while cutting and styling hair or doing beauty therapy techniques. 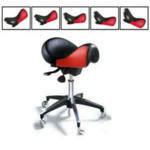 Studies have proved that saddle style seating reduces back, neck and arm discomfort, improves leg circulation. It comes with smooth running castors. Crewe Madeira Island Unit. 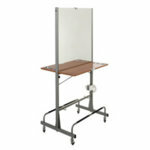 The Madeira is a metal framed unit that features storage space, making it space efficient for colleges. The units are supplied with electrical sockets and dryer holders as shown. Dimensions height 183cm, width 67cm, depth 73cm. Direct Salon Supplies Oslo Duo Island Station in Black, Twin Styling Station including 2 Black Oslo footrests (Click on picture to see a picture of the footrest). Size: Height 192cm, Width 86cm, Depth 82cm. Please allow 3 to 4 weeks for delivery. Please ring for details 01270 630280. 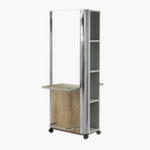 Direct Salon Supplies College Mobile Dressing Table Island Unit. Space saving and equipped with all essentials including folding shelves and removable foot rest with plastic protection, fitted sockets on both sides, 4 braked wheels, holders for hairdryers, styling tongs, brushes etc, and chrome plate for apprentice heads, making this unit ideal for training. Size 76cm x 61cm x 165cm, Mirror sizes 72cm x 89cm x 5mm. REM College Cornell Island Unit with castors is a great college styling unit. It is finished with a silver storage section with silver metal corners. The footrest is standard on the Cornell Island Unit. Shelf and front panel are available in any of the REM laminate finishes. Sizes Height 1960mm, depth 940mm, width 780mm. The Wall Unit is finished with silver metal corners. Footrest is standard. Shelf and front panel is available in any of the REM laminate finishes. the Cornell Wall Unit comes with optional extras which include: dryer holster, twin socket and wig clamp. Please call 01270 630280 for details. REM Colour Store is a wall mounted unit and is available in single unit or it can mounted next to each other as in picture (Please click on picture for more images, REM colour store times 2 or 5). The REM Colour Store can be positioned vertically or horizontally to best suit you and each single unit can hold approx 72 tubes of colour. The Rem Colour Store is available in Black Only. Dimensions width 46cm, height 40cm, depth 23cm. Rem Columbia Storage Units, upper and lower dispensary and storage units are available in two widths 500mm and 1000mm(please use the drop down box to choose), they are available in 4 colours black, white, moonlight or twilight from the Rem range, the 1000mm base unit is also available with sink and drainer option. The columbia comes with one internal adjustable shelf in each unit. 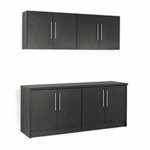 Dimensions: Columbia wall units width 100cm or 50cm, height 72cm, depth 31cm. 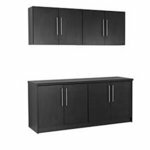 Dimensions: Columbia base units width 100cm or 50cm, height 72cm, depth 60cm. Please note in our image shown here are 2 x 500 wall units and 2 x 500 base units. available in any colour from the Rem laminates, Columbia upper and Columbia lower dispensary and storage units are available in two widths 500mm and 1000mm(please use the drop down box to choose), Columbia 1000mm base unit is also available with sink and drainer option. The REM Compact Vanity Unit can be specified in any of REM's colour laminate finishes. The picture shows the compact vanity in the light Winchester Oak. Sizes: Height 93cm, Width 60cm, Depth 35cm. 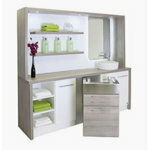 Rem Aquarius Vanity Unit, available in any colour from the Rem laminate colours. 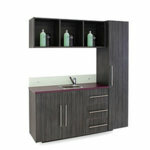 Aquarius consisting of vanity section with basin, taps and glass splash back, large side store and upper store. REM Boston Unit features stainless steel handles, basin, and comes with single cold and hot water chrome tap, with cupboard shelves which are height positional. Available in Dusk, Dawn, White or Black(Please choose from the first drop down box). 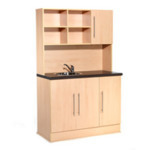 The REM Boston College Coloured Unit is available in any colour from the Rem laminate chart, it features stainless steel handles, basin, and comes with single cold and hot water chrome tap and cupboard shelves which are height positional. 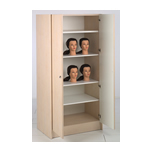 REM College Head Storage Unit features chrome finish handles and four height position shelves. 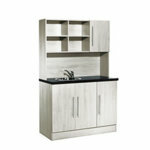 This unit is available in any of the REM laminates finishes. REM Airlite Portable Beauty couch with carry case (Please use the drop down box to choose). Ideal for the beautician on the move, sturdy but lightweight couch, light to carry at only 14.5 kilos, adjustable headrest, integral face hole, height adjustable legs. Airlite couch is fully foldable and portable. Dimensions width 59cm, height 61 to 82cm, depth 185 cm. Maximum working weight 170 kilos. 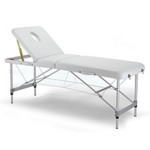 Direct Salon Supplies Dorset Hydraulic Chair with fully adjustable chair/couch position Available In White or Black, the Dorset is a multi-therapy hydraulic chair, 360° full circle locking, breather hole with cushion. Width 62 cms(24") wide, has pillow and facehole, rich full 10cms of fire resistant foam padding, height adjustable from 60cms(23") to 80 cms(31") with easy foot pump action. Length 1.86m. (73") Finish is metal work white and chrome pump. The Dorset also has removable arms so the bed can lay completely flat. Available in three great colours white, black or silver(Please use the drop down box to choose). Dimensions width 32cm, height 68cm, depth 22cm. REM Beauty Stool with back rest on a chrome, 5 star, gas lift base. Available in any colour from the REM fabric range. Sizes: Height 48 - 67cm, Width 62cm, Depth 62cm. REM Beauty Stool on a chrome, 5 star, gas lift base. Available in any colour from the REM fabric range. REM Beauty Therapist Stool with backrest, available in White or any other colour from the large range of colours from the REM fabric range(please use the drop down box to choose your colour). Dimensions depth 50cm, width 50cm, seat height 52-66cm. Whether you are looking to buy an individual piece or carry out a complete salon refit, choosing the right salon furniture can make a huge difference to your customers. In a competitive sector, providing a great experience to your clients can make all the difference. 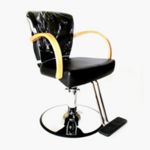 At Direct Salon Supplies, be have a superb range of salon furniture from all the best brands. Our range includes everything a salon owner would need, including hood dryers and processors, salon chairs, stylist stools, wash points, waiting furniture, Salon Master Hot Water Systems, dryer banks, styling units, salon trolleys, reception furniture, magazine racks and barbers furniture. Did you know we aslo have a dedicated, mobile friendly furniture site at directsalonfurniture.co.uk click here to visit our site and explore our range. 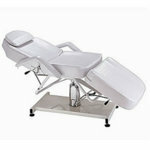 We also provide an extensive range of beauty furniture. With the help of experienced salon designers, we also supply a great range of salon furniture packages where a selection of items have been put together to work well as a theme. These packages are a great way of giving an instant overhaul to a tired looking hair or beauty salon. Thinking about your salon os a series of distinct zones, each with a particular function is a great way to come up with an overall furnishing plan. A reception area should be comfortable, stylish and welcoming. The design of the styling area should take into account the needs and working environment of the stylist and allow for the most positive customer experience possible. The selection of the furniture will give your customers a lasting impression of the standards and quality of your salon so this decision is often critical to your business success. To discuss your salon furniture needs, please call us on 01270 630280 and we will be happy to advise you on the various options.